Anglers won’t see any changes to chumming or steelhead possession limits as the DNR has decided changes are not needed at this time. Department of Natural Resources fisheries staff recently discussed with the public restrictions on the amount of organic material that could be used as chum and a reduced steelhead possession limit on four West Michigan rivers. Seven meetings were held across the state in July with approximately 275 participants in attendance. Comments also were received through phone and email. The discussions were initiated after the DNR received requests from anglers and constituent groups to lower the steelhead possession limit on the Muskegon, Pere Marquette, Little Manistee and Big Manistee rivers. 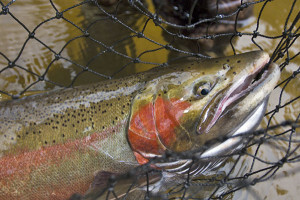 A three-fish daily possession limit for steelhead has been in place since 1989. Michigan boasts some of the best river steelhead fishing in the country. Angler interviews conducted on these four rivers in the past indicated only 5 percent of anglers fishing for steelhead harvest the three-fish daily possession limit. The DNR also recently received complaints related to excessive use of chum on select Lake Michigan rivers, especially the Muskegon River. The concern stems from lower catch rates for those who do not use chum. The DNR does not consider chumming as a biological threat to fish populations in general.